Abstract: There is little in the social work literature that specifically addresses how social work students learn practice. More specifically, little is known about how the social, interactional contexts of practice learning, perhaps best exemplified by field education, influence the process and outcomes of practice skill development. Given the research and theory that suggest that interpersonal processes exert powerful, reciprocal processes on interactants’ behaviors, this area of study appears to offer potential insights into the challenges of practice learning given the impact of these dynamics. 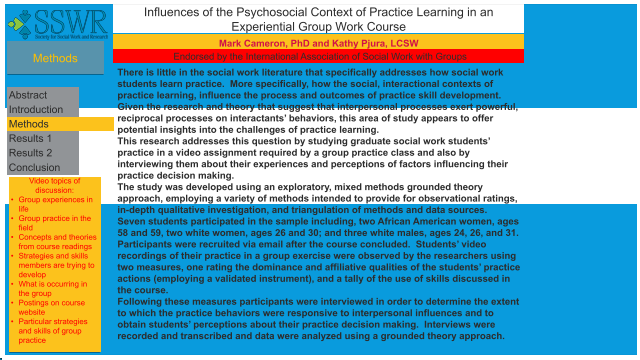 This paper intends to address this question by studying graduate social work students’ role play practice in a video assignment required by a group practice class and also interviewing them about their experiences and perceptions of factors influencing their practice decision making. Summary: Poster presentation at SSWR 2019 Annual Conference References: Corbin, J., & Strauss, A. (2015). Basics of qualitative research: Techniques for procedures for developing grounded theory (4th ed.). Boston: Sage. Jost, J., Ledgerwood, A., & Hardin, C. (2007). Shared reality, system justification, and the relational basis of ideological beliefs. Social and Personality Psychology Compass, 1-16. Kiesler, D. (1983). The 1982 interpersonal circle: A taxonomy for complementarity in human transactions. Psychological Review, 185-213. Kiesler, D. (1992). Interpersonal circle inventories: Pantheoretical applications to psychotherapy research and practice. Journal of Psychotherapy Integration, 77-99.